It's again that time of the year when juicy, yummy mangoes are abundantly available in the market and I have to admit, Mango is my favorite fruit. Summer is the time when all my favorite fruits are available---Honeydew melon, Watermelon, Mangoes, Litchies, Guavas, Ripe Payayas, Palm fruits, berries, cherries, plums, peaches and what no, all sorts of exotic fruits are in season. That's why in summer I feel like eating fruits only. So many yummy things you can make with these fruits like, Smoothies, Lassis, drinks, punches, fruit salad, dessert or can use them in a bake. Baking Soda : 1 tsp. Pre-heat oven to 175 degreeC or 350 degreeF. Grease with a little butter your muffin/cupcake tray or any other baking pan you are using. Take all dry ingredients, i.e., two types of flours, baking soda and baking powder in a bowl and mix well. In another mixing bowl, beat butter, oil and condensed milk together. 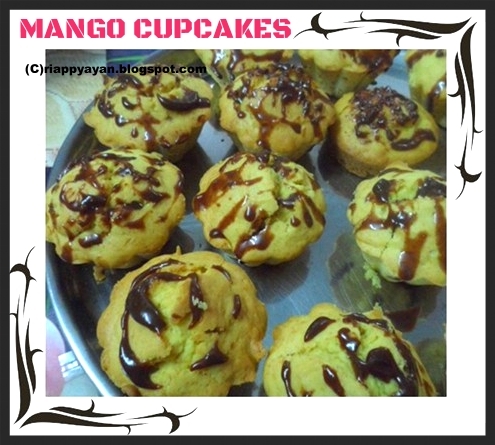 Peel the mangoes and blend in a mixer until well blended. Add this to mixing bowl and whisk till well blended with others. Also add mango essence and food color if using. Now slowly add dry ingredients in the mixing bowl and blend until whole dry ingredients are used. Blend until you have a creamy batter, do not over blend the batter. Pour into your prepared baking pan and bake until a toothpick inserted comes out clean. it takes approx. 30-45 minutes. In this post, I'm announcing the theme of "SPOTLIGHT" of this month. As you see I'm going crazy over summer fruits, I want to know How you eat your summer fruits. So, the theme is "Summer Fruits"
1. 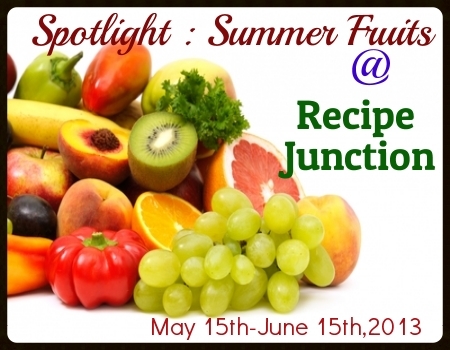 Prepare any kind of dish using Summer fruits, like drinks, smoothies, lassi, punch, cocktail, dessert anything, even use it in your baking..Share with us how you eat your summer fruits. Eggs are allowed. 2. Post it in your blog from May 15th to June 15th,'13 and link it to this announcement page. You can send multiple entries. 3. Archived entries rae allowed if reposted with this announcement link. 4. The use of logo is mandatory as it helps to spread the word. 5. Non-bloggers can send their entries to the email address mentioned below. 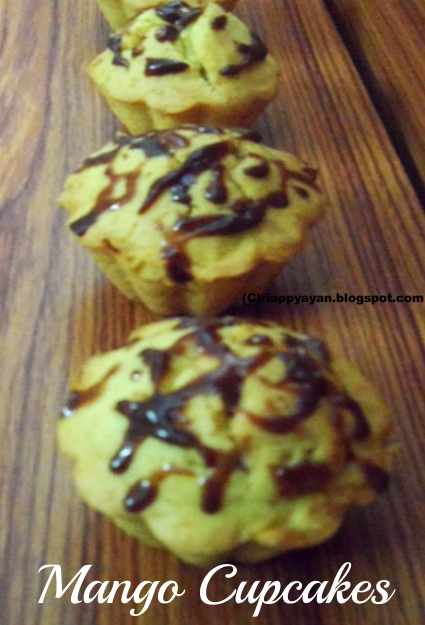 Indrani, i have linked my recipe..Nice Theme!!!! 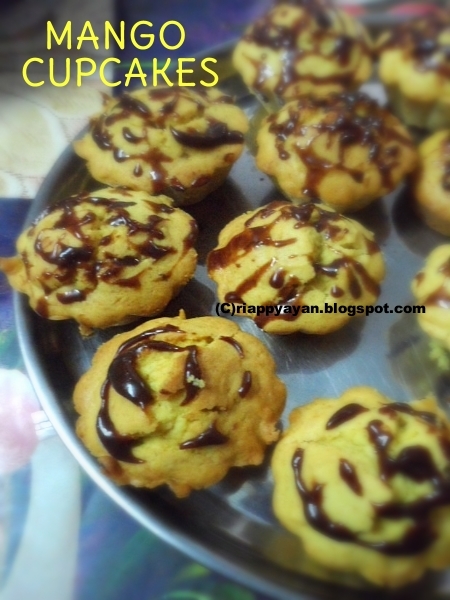 Wonderful cupcakes Indrani. Lovely event too. Will try to send my entries dear. I think mistakenly period of the event is wrong, do check it pls. Happy hosting! mango flavoured sweets are always my favorite..loving this recipe completely..liked the event too but i am bit congused with the period mentioned here..
great event..will try to link something..
First time here,you have a lovely blog..